Dee Jae, ‘the Starving Artist’. Photo: Peter Barrett. It was to the strains of Celine Dion’s The Power of Love and a plate of deep-fried pork bits that I finally “got” Filipino food. I’d been in the south-east Asian archipelago of more than 7000 islands only a week and had been struggling to understand the heavy stews and braises on offer. Big on salt, garlic and vinegar, the flavours were intense and nothing like the light, herbaceous dishes I’d eaten in Thailand and Vietnam. Colonised by the Spanish for 333 years and the Americans for 48, the Philippines is a bewildering mix of these cultures and earlier inhabitants, including indigenous Malayo-Polynesians, Hindus, Buddhists, Chinese and Arab traders. Lechon (pork) is a favourite national dish. Photo: Peter Barrett. No wonder I was confused about the food. But at a night market in Poblacion, Manila’s edgy red light district, I tasted lechon sissig: bits of boiled, roasted then fried pork cheek, snout and ears laced with fresh chilli, vinegar and lemon juice, served with a pile of steamed rice. The pork had just the right amount of heat and salt and there was even a pleasing crunch provided by tasty (but perhaps best unidentified) pieces of deep-fried piggyness. As the cover band played on (“Whenever you reach for me, I’ll do all that I can… “) I reached for the dish’s symbiotic partner, a cold bottle of San Miguel beer. The pork (last stop on an excellent neighbourhood food tour by local street artist Dee Jae Pa’este, aka the Starving Artist), the beer and the corny cover band formed a supernatural holy trinity of understanding in my tiny mind. I was hooked. Sissig, it turns out, is also a favourite of Anthony Bourdain, who plans to unleash it on New Yorkers at a new street food venture, the Bourdain Market, set to open in 2019. So, is Filipino food the next big thing? Who really knows. But this historically complicated cuisine is definitely worth exploring. Here are six other must-try dishes to get you started. A vinegar, salt and garlic braise that originated here in pre-refrigeration days, this is probably the closest you’ll get to a Filipino national dish. Pork, chicken, beef, goat and vegetable adobos are common but the best I tasted was a succulent lamb version, prepared at Tilde Cafe (5417 Matilde, Poblacion, Makati, 1210 Metro Manila). This one included bay leaf but most adobos include soy sauce, with a few varieties including coconut milk, turmeric or annatto. Be sure to eat adobo with rice in order to balance out the intense flavours, which can range from bold saltiness to sourness. 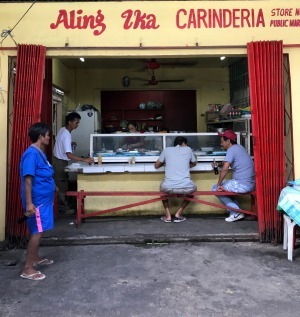 These Filipino spring rolls are served fried or fresca (fresh), as I enjoyed with food writer Guillermo “Ige” Ramos at his favourite childhood hangout Aling Ika Carinderia (Cavite City markets, about 30 minutes’ drive south of Manila Airport). The lumpia crepes (rice flour, water and eggs) were made by hand a few doors down on large gas fired hot plates. They are then filled with a mixture of lettuce and vegetables, then topped with a sauce made from pounded shrimp heads, soy sauce, sugar and cornstarch. “Lumpia is Chinese but here it also has chicharron (pork crackling), lima beans and other Mexican ingredients, like coriander,” explains Ramos. No guide to Filipino food would be complete without reference to the pig. Thanks to the Chinese and Spaniards, pork is everywhere here (except perhaps in Muslim communities in the south). The most popular fiesta-style version is charcoal spit-roasting, and the province of Cebu has a reputation for being the best exponents of the craft, having perfected the art of super-crisp skin. 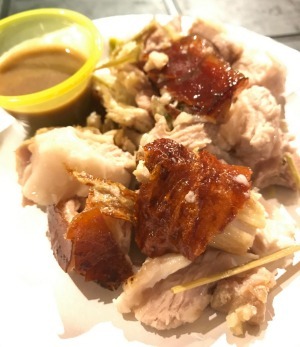 Try popular chain Rico’s Lechon (1, Paseo Saturnino along Maria Luisa Road, Cebu City) or RDJ Lechon Belly (A-venue Mall night market, 7829 Makati Avenue, Manila). For just-cooked, cut-off-the-bone-in-front-of-you lechon, Newman recommends Zubuchon (One Mango Mall, General Maxilom Ave, Cebu City) in Cebu. Introduced by the Chinese, who arrived in the Middle Ages and stayed throughout Spanish colonisation, pancit (or pansit, meaning “noodles”) have spread throughout the Philippines. Each community has its own take and in Cavite, a Manila trading port once used by Spanish-Mexican galleons for 250 years, a version emerged using squid ink that some food historians believe predates its use in Spanish Basque cuisine. 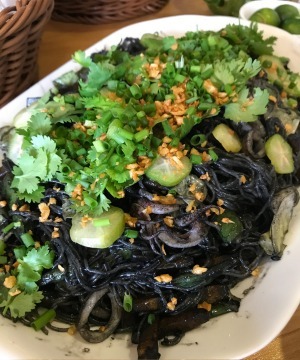 Thin vermicelli noodles are coloured with the ink, tossed with baby squid, cabbage, red onions, beans, coriander and chicharron. The key to the dish is fresh slices of bilimbi, a tart, star-shaped fruit that balances out the flavours. Try it at Cafe 506 (Kawit, Cavite). From countless cooked rice treats (kakanin) to halo-halo (“mix-mix”, a curious national-identity-defining treat that combines shaved ice, sweetened beans, jelly, purple yam ice-cream and evaporated milk), desserts are a highlight of Filipino cuisine. My favourite was brazo de Mercedes (“arm of Mercedes”), a light meringue wrapped around a rich, condensed milk custard filling. Try a version at Abaseria Deli & Cafe (32 President Quirino Street, Kasambagan, Cebu City). For an impressive halo-halo go to the Peninsula Manila Hotel (corner Ayala and Makati Avenues, 1226, Makati, Metro Manila). My tip: find a friend to share because servings are huge. Further reading: 7000 Islands: A Food Portrait of the Philippines, by Yasmin Newman; Memories of Philippine Kitchens, by Amy Besa and Romy Dorotan. Peter Barrett travelled to the Philippines as a guest of Philippine Airlines and the Philippine Department of Tourism. This story originally appeared in Epicure/Good Food in The Age and the Sydney Morning Herald on Tuesday, September 19, 2017.